Red Copper™ Brownie Bonanza™ | Official Site | The Ultra-Tough Ceramic Pan That Makes Perfect Brownies Every Time! The Ultra-Tough Ceramic Pan That Makes Perfect Brownies Every Time! The Solution To Hard, Crumbling Brownies That Stick To The Pan! Brownies have never been this great! The removable grid is so easy to use, your brownies will be the talk of the party! Everything you make using Brownie Bonanza is the perfect serving size and slides right onto the plate! Tired of your brownies sticking to the pan? We've got a solution to your brownie woes! The new Red Copper™ Brownie Bonanza™ takes brownie making to the next level. READ FULL DESCRIPTION This isn't your regular old baking pan. Red Copper™ Brownie Bonanza™ is made with non-stick ceramic, so everything slides right out - even sticky marshmallow treats! It's so easy to use. Pour batter into your Red Copper™ Brownie Bonanza™, insert the brownie grid, and put it in the oven. You've got 18 perfectly portioned brownies that are already sliced! 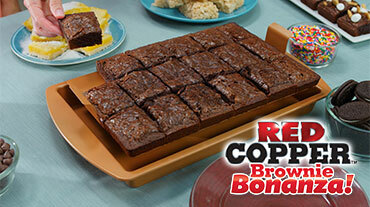 Red Copper™ Brownie Bonanza™ bakes each piece separately. Place Red Copper™ Brownie Bonanza™ on the included custom stand and you'll have an instant serving tray. It's great for picnics, parties, and outdoor BBQs. Red Copper™ Brownie Bonanza™ is the same size as your standard 13-inch by 9-inch pan, so you won't need to adjust your recipe. Bake beyong brownies - try with dump cakes, mini pizzas, and biscuit sliders! Plus, Red Copper™ Brownie Bonanza™ is dishwasher safe, so cleanup is a cinch. Crumbling, boring brownies are a thing of the past with Red Copper™ Brownie Bonanza™! Get Your Red Copper™ Brownie Bonanza™ with custom stand and recipe booklet today for just $19.99 plus $7.99 shipping and handling. But wait! You can DOUBLE your order and get a second Red Copper™ Brownie Bonanza™ plus the Red Copper Donut Pan. Just pay a separate fee of $19.99. Hurry and order now while supplies last! *Refer to your stove manufacturer's instruction manual before using on a glass cooktop. Red Copper™ Brownie Bonanza™ is non-stick so your brownies slide easily off the tray! The Brownie Grid Ensures You Get 18 Perfectly Sized Portions. Make All Kinds Of Delicious Treats With The Included Recipe Booklet. Brownie Bonanza Bakes Each Square Individually So It's All Edges! Get Your Red Copper Brownie Bonanza with custom stand and recipe booklet today for just $19.99 plus $7.99 shipping and handling. But wait! You can DOUBLE your order and get a second Red Copper Brownie Bonanza plus the Red Copper Donut Pan. Just pay a separate fee of $19.99. UPGRADE your offer to the Deluxe Double Coating Brownie Bonanza, custom stand, and recipe booklet for only $29.98 plus $7.99 shipping and handling. Double your Deluxe Offer and receive a SECOND Double Coated Brownie Bonanza, custom stand, and recipe booklet, plus the Red Copper Donut Pan. GUARANTEE: Red Copper Brownie Bonanza has a Built To Last Guarantee. Should anything happen to your Red Copper Brownie Bonanza under normal usage simply return the unit and you will receive replacement, less shipping and handling. Mistreatment, misuse, and intentional abuse of Red Copper Brownie Bonanza is not covered under the Built To Last Guarantee.